A lot has been written over the last couple of years on how China is leapfrogging brick-and-mortar retail and has whole regions going from agriculture straight to an economy where people sell and buy stuff online. Most fascinating is how Alibaba with its marketplace Taobao has morphed whole rural villages into specialized manufacturers. Thanks to the online marketplace those villages can sell to the rest of China (and abroad in some cases). Today, the township and its surrounding area are China’s domestic capital for one rather specific category of products: acting and dance costumes. Half of the township’s 45,000 residents produce or sell costumes—ranging from movie-villain attire to cute versions of snakes, alligators, and monkeys—that are sold on Alibaba-owned Taobao, the nation’s largest e-commerce platform. In November 2016, the State Council Office on Poverty Alleviation, along with 16 other ministries, released guidelines calling for a massive expansion of e-commerce in rural areas as part of the fight against poverty. By 2020, the guidelines state (link in Chinese), impoverished rural counties should quadruple their e-commerce sales. Alibaba says that, nationwide, 18 villages considered to be in poverty by the national government are now Taobao villages, selling more than 10 million yuan ($1.45 million) worth of goods online per year. It estimates an additional 200 villages designated as impoverished by provincial poverty standards—based on higher income thresholds—have reached a similar sales marker. Villages in Hebei province’s Ping county, a few hundred kilometers north of Daiji and a nationally designated poverty area, produce children’s bicycles (link in Chinese). Meanwhile, in one village in the southwestern province of Yunnan, members of the Bai ethnic minority sell silver handicrafts (link in Chinese), recording 19 million yuan in sales on Taobao in 2015. ..but nonetheless, this also shows how deeply entrenched Alibaba not only on the buyer but also on the seller side becomes. When a marketplace like Taobao makes you escape poverty, you then depend deeply on the income it provides. This makes it unlikely (not impossible, but unlikely) to switch to a different platform as a seller; wether that may be Tencent’s WeChat, JD or Amazon Marketplace or any other platform. You go all in on what lifts you up higher than anything that came before. So, whoever gets those sellers first online likely earns a lot of loyalty from them in the process. 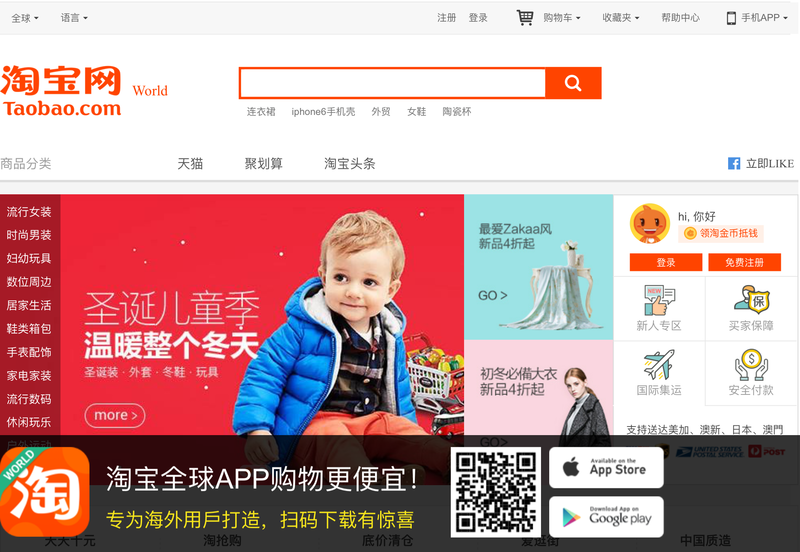 It’s focused especially on the central and western regions, where the company will invest 10 billion yuan to build 100,000 Taobao service centers in remote areas and expand logistics and training to bring villages up to speed for how to Taobao-ize their economy. The central government has signed agreements with both Alibaba and Jingdong, another major platform, to spur e-commerce development in the name of poverty alleviation. Taobao entrepreneurs in Daiji have started selling costumes abroad, particularly to Malaysia, Vietnam, and other countries in Southeast Asia. The next step, they say, is to improve the quality of the costumes enough to reach higher-cost markets in Europe and the United States. ​Not surprisingly, those small to mid-size operations need all the help they can get to sell their goods abroad. This long tail will almost always go with the one-stop-shop solution.